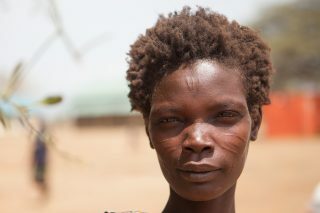 Lochebei Lokorio’s husband was killed last year in a tribal dispute, leaving her with five children and pregnant. She is receiving food aid through CFGB. Between March 17 and June 30, 2017, PWS&D raised $118,244 in support of our ongoing famine response. These funds will be matched 1:1 by the federal government’s Famine Relief Fund, which will be programmed by agencies selected by Global Affairs Canada. PWS&D is responding through the Canadian Foodgrains Bank to provide support to those affected by famine conditions. Nutrition feeding centres have been established in South Sudan, where children under five and lactating mothers can be screened for malnutrition. Children suffering from severe acute malnutrition are receiving treatment with therapeutic foods. Lactating mothers and children with moderate acute malnutrition are being treated, and caregivers are being educated in proper hygiene and child feeding practices. The project is benefitting 42,000 people. Sarah’s daughter Martha and Regina’s son Kai’s lives were saved because of generous support for this project. Vicky Akello (43) is a single mother of eight children. Since the food distributions, Akello says her children’s health improved and her stress was reduced. Also in collaboration with partners at Canadian Foodgrains Bank, PWS&D is helping support emergency food distributions for 13,500 individuals (approximately 2,250 households) in South Sudan. Families will receive monthly distributions of sorghum, beans, oil and salt. Distributions will prioritize households who were unable to harvest last season, women or child-headed households, households with malnourished children, pregnant and lactating mothers, the elderly, and people with disabilities. Besta Asa’s family has hope for the future because of this project. While the period to receive matching funds from the federal government has ended, the need remains high. PWS&D continues to accept donations in response to the ongoing crisis. Additionally, any gifts made to PWS&D’s ongoing famine response will continue to be matched up to four times through the Canadian Foodgrains Bank.